Sharon Speer wrote in today to let us know about the benefit dinner that the Portland Peninsula Optimist Club will hold on February 26, 2014. 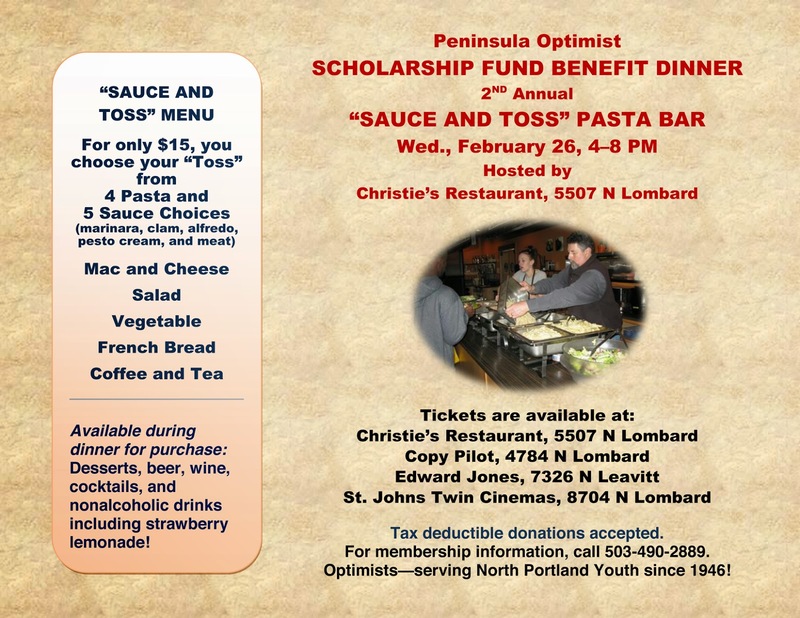 This will be the second year that Christie's Restaurant, 5507 N. Lombard, Portland, has helped with the "Sauce and Toss" with proceeds going to the Portland Peninsula Optimist Club Scholarship Fund. For only $15,you'll be treated to your choice of 4 types of pasta and 5 types of sauce plus all the trimmings. Click on the picture to enlarge and read more. 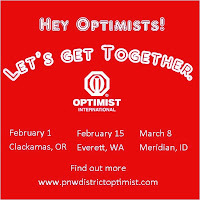 Governor Fred Wallace and his VIP Teresa are looking forward to hosting the first regional meeting for the second quarter of the PNW District - Optimist International administrative year. 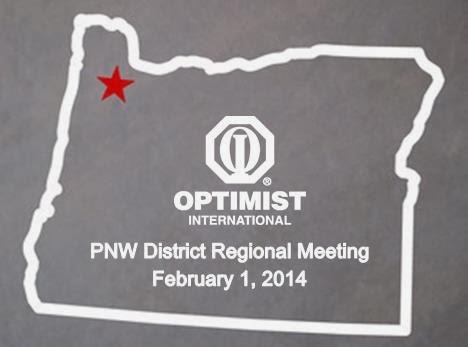 The first regional meeting will take place this Saturday, February 1, at the Monarch Hotel in Clackamas, Oregon. You may still register online by clicking here. The regional meetings are just one of the ways that the leadership team can bring the business of the district to a local level. In addition to reviewing the district activities, including the scholarship contests, among other things, there will be a special emphasis on growth. Membership should at all times be a priority for your Optimist Club for without members, we can't do the things that we want to do in our local communities. In order to help you get acquainted with the district business that will be at hand, District S/T Ray Hilts has provided the minutes from the first quarter meeting for your review. Click here for the minutes from October 2013. Lt. governors and committee chairs are encouraged to be prepared to speak about their respective projects and club presidents will be asked to share a story or two about their favorite or most successful club projects. Of course one of the best reasons to attend a district meeting is to recharge your optimism. Governor Fred asks you to think about this question: Why did you become an Optimist? Be ready to share your story of belonging with the group. We're looking forward to seeing you at a regional meeting soon! Download the Oregon Regional Agenda here. Congratulations are in order for the Middleton Area Optimist Club and the Twin Falls Optimist Club. Both were given Distinguished Club status by Optimist International for the 2012-2013 administrative year. The announcement came via the annual Awards Hotline distributed to all Optimist Club leaders by Optimist International on January 15, 2014. Earning Distinguished Club status means that the club, in addition to performing three or more service projects, recognizing an outstanding person or organization for optimistic achievement, and paying all financial obligations in a timely manner, has also added to the membership growth of Optimist International. This can be accomplished by starting a new Optimist Club or by adding a net 15 new members to the club's roster. Both the Middleton Area and Twin Falls Optimist Clubs qualified through club membership growth. By adding new members to their existing club, they were able to extend their reach, do more projects in their local communities and continue to generate new enthusiasm for the values of an Optimist Club. To be awarded the Distinguished moniker, clubs must first meet Honor Club requirements. Other clubs that were recognized as Honor Clubs in 2012-2013 are the Albany Optimist Club, Portland-Northeast Optimist Club and the Optimist Club of Vancouver, BC. Every year, every Optimist Club should strive for Honor Club status for it signifies that the club is doing all that it can to plan for its future in its community. Sometimes leaders will say that they don't do it for the awards, but rather, they do it for the kids. Well, this is your wake-up call: if you are not doing the minimum requirements of Honor Club, your club will not be around to do it for the kids in the future. This is your goal: be an Honor Club in 2014. Find out how. This is your challenge: be a Distinguished Club in 2014. Find out how. Congratulations to our exceptional Optimist Clubs this year. 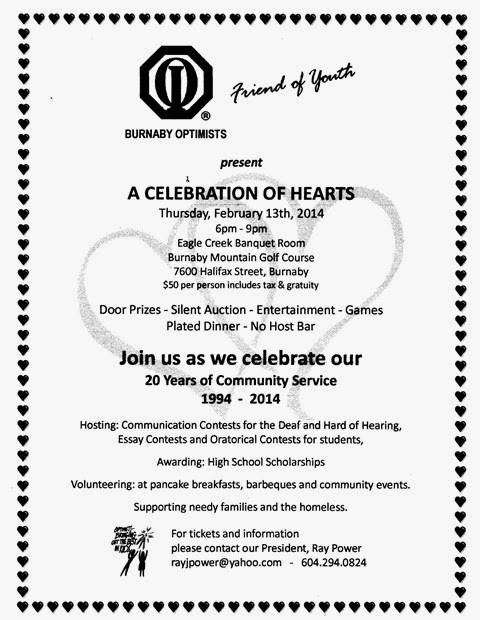 The Burnaby Optimist Club is celebrating its 20th anniversary with a Celebration of Hearts dinner on February 13, 2014. The Burnaby Optimist Club was started by the Coquitlam Optimist Club and officially organized on March 26, 1994. According to Ray Power, President, Burnaby Optimist Club, they will celebrate their service to the community including the Optimist International Scholarship programs and local scholarship programs along with their active volunteer efforts. To attend, please contact Ray Power at 604.294.0824. 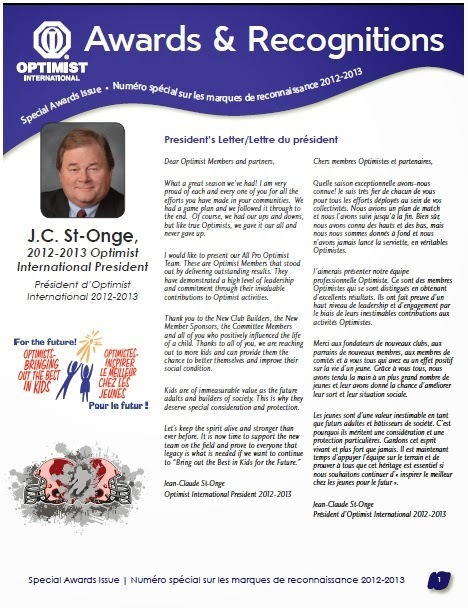 As the new year gets underway, it's time to think about and to begin planning your Optimist Club's activities for 2014. There the Optimist International Essay, Oratorical and CCDHH contests for students. Each of these are fairly simple for a club to perform and you can find step by step instructions here. A great number of Optimist Clubs hold Easter Egg Hunts and although Christmas is only 10 day past, believe it or not, Easter will be here before you know it. And then there are all kinds of regular activities that Optimist Clubs host in between the major Optimist International events. For example, in addition to their regular programs, the Meridian Optimist Club has a junior rifle program that meets weekly through the spring and the Middleton Area Optimist Club hosts bingo once a month, every month. Other clubs have their favorite ongoing activities as well including meeting every week to share fellowship and learn about their communities with informative programs. Yes, Optimist Clubs are a vital part of our lives and bring color to the places where we live. That's why it's good to come together every so often with other Optimist Club members to share our enthusiasm. This year, the PNW District will host three regional meetings that are designed to do just that. 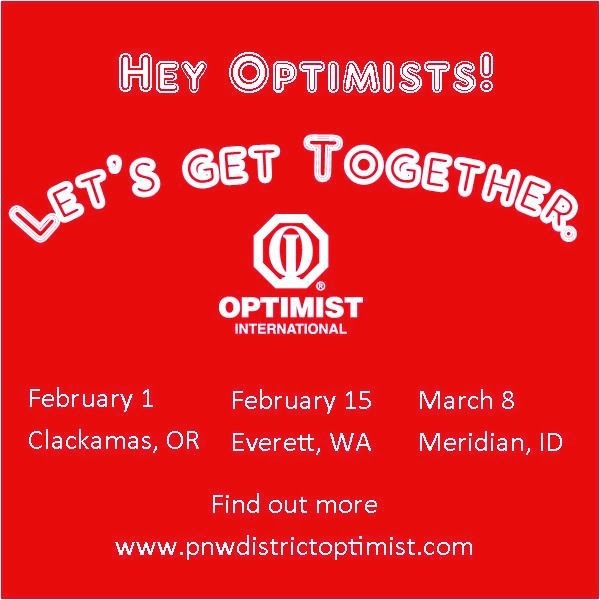 The regional meetings will allow Optimist Club members to share the success stories of our local clubs and provide advice and guidance for assessing old programs and adopting new programs. It will also offer information that your club needs to know for the scholarship contests, new membership growth, using websites effectively and gaining publicity for your Optimist Club and projects. Download an agenda here. Optimist Club members are encouraged to wear their club shirts or vests and to show their club pride. Bring a group and make the regional meeting a fun outing for your club.